It pains me to admit that -- despite how much I love the Criterion Collection -- they just don't seem to know what makes a B-movie a cult movie. You can't just trot out any picture that was shot in six days sometime in the 1950s and expect it to be engaging. Sadly, that is the case with The Atomic Submarine. Even sadder, though, is that now I've watched the entire Criterion Monsters and Madmen collection, and I have to report that none of the movies are particularly noteworthy. 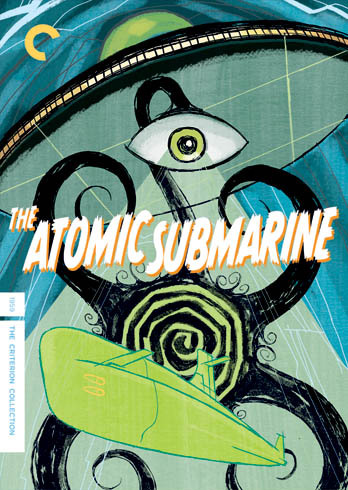 The Atomic Submarine has the flaws you'd expect on a movie shot in six days (and probably written in even fewer) -- bizarre and nonsensical dialogue, utterly inexplicable character motivations, hundreds of feet of stock film footage, and strange lapses in logic or narrative -- but the biggest problem with the movie itself is the fundamental place that it's coming from. In the movie, submarines exploring the Arctic Circle are being mysteriously attacked by some type of energy that's sending them down to Davy Jones' locker. The U.S. Navy puts together a crack squad of seamen and sends them off aboard the Tiger Shark, the baddest mamma-jamma in the whole fleet of atomic submarines. Nobody except a random Englishman aboard seems to know what they're all doing there, but apparently the plan is to spend the next few months making a big, bow tie-shaped path over and around the North Pole in the sub. As it happens, the disturbance that's been sinking subs is actually an alien spaceship that's been staying underwater, since it originated on an aquatic planet. Once the crew of the Tiger Shark figure this out, boy howdy is it killin' time. The movie really loses points due to this shaky moral footing. This is First Contact with an alien race, and not only are the humans immediately resolved to kill it, but the movie holds up their mindset, pursuit, and actions as right and just. If a movie has something interesting to say, I'm willing to forgive...well, pretty much every single failing in Plan 9 from Outer Space...but The Atomic Submarine represents the kind of belligerent jingoism that left the entire world on the precipice of self-destruction for basically the entire second half of the twentieth century. Penalties: -1 for making human nature look particularly brutal and thoughtless; -1 for an alien that looked like a live-action Mr. Hankey and made my stomach hurt. Cult Film Coefficient: 3/10. Very little good I can say about this. Howdy Ho! I'm here to colonize your world!